This is another news item we heard about during our trip to Taipei a few weeks ago. 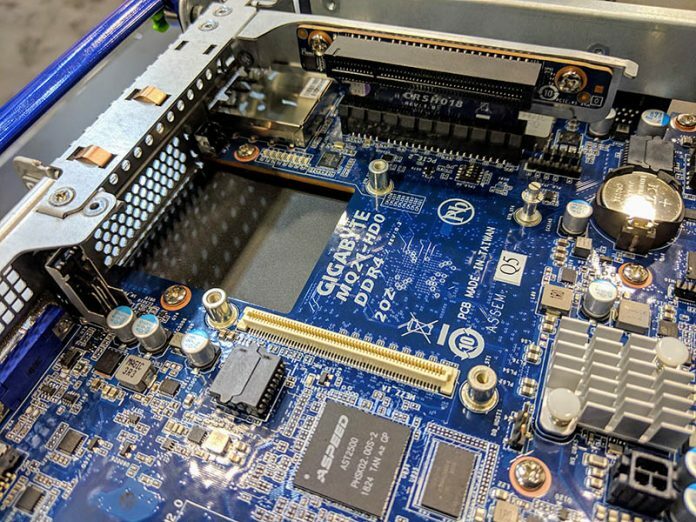 At Supercomputing 2018 we saw a Qualcomm Centriq 2400 production platform. The Gigabyte H221-Q20 is slated to be the first, and potentially only, 19″ rack Qualcomm Centriq 2400 platform on the market. At STH we attended the Qualcomm Centriq 2400 launch event which had all the hallmarks of a big company silicon launch. 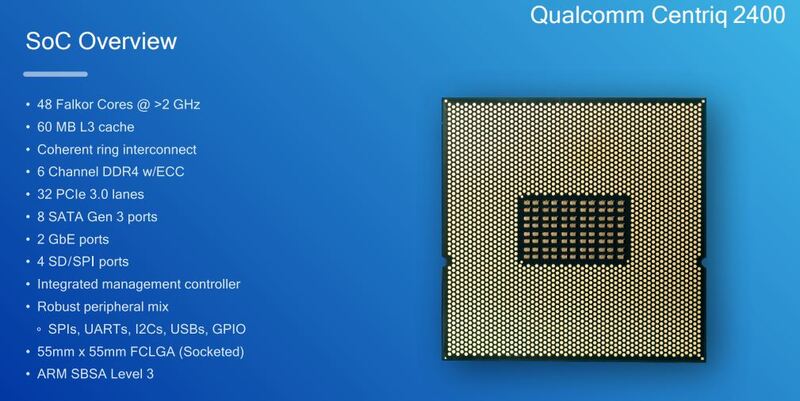 Here is the overview of the up to 48 core Arm CPU. Qualcomm eventually ended development of the Centriq 2400 as it was failing to gain adoption outside of the Microsoft ecosystem. It was a single socket only part in a market that wants dual-socket servers. For example, AMD EPYC 7001 servers are seeing pressure to go dual-socket in the market even when the company has tangible benefits (same PCIe lanes and lower prices) for single socket SKUs. The Gigabyte H221-Q20 is a 2U system with dual 1U swappable nodes. 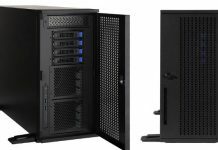 This allows for easy servicing and represents a trend toward more modular servers. There are dual power supplies. 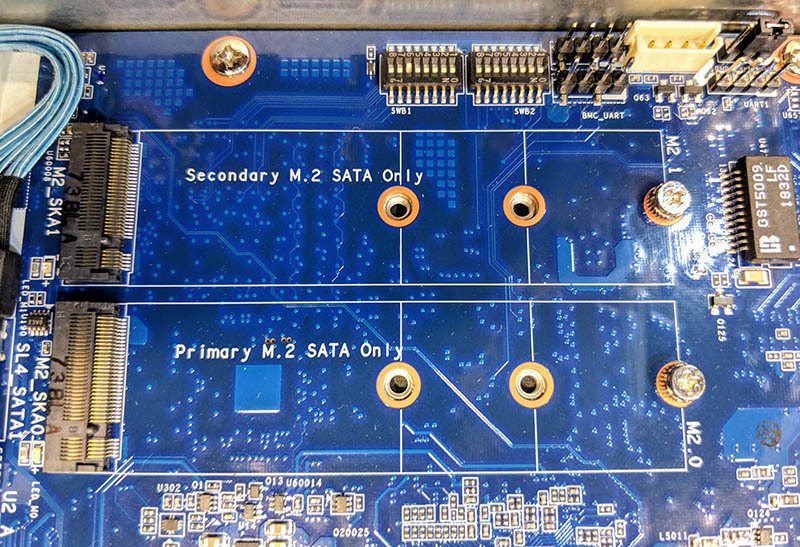 Two SATA-only M.2 drive slots are present on the motherboard for redundant boot media. Each node has 12 DIMM slots for each SoC’s 6 channel memory in 2DPC configuration alongside the QDF2400 socket. Each system also has an OCP mezzanine networking slot along with quad 1GbE networking. For those that want more, there are three additional PCIe slots on risers, however, there are still only 32 PCIe 3.0 lanes to the SoC. 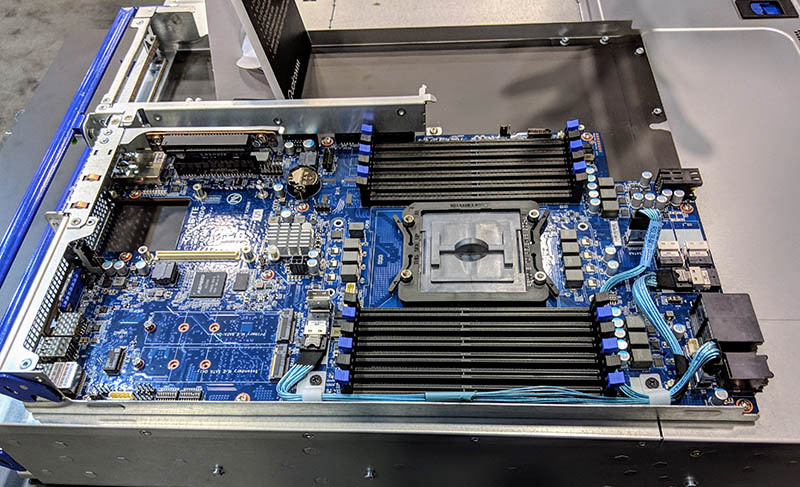 The front of the Gigabyte H221-Q20 chassis has 12x 3.5″ hot-swap bays. If you want a high core count, low power development platform, and do not want Ampere’s ecosystem, then this is certainly an option. At the end of the day, there is a market for those who do not want an Intel, AMD, Marvell, or Ampere CPU and want something different. This may not be the largest market, but it will be interesting to see what the adoption of these systems will be.